Most of you already know we love our morning meals. But sometimes we like to mix up our usual breakfast routine by creating a savory version of a traditionally sweet dish. Our Everything Bagel French Toast Casserole is a hearty and satisfying twist on classic french toast. 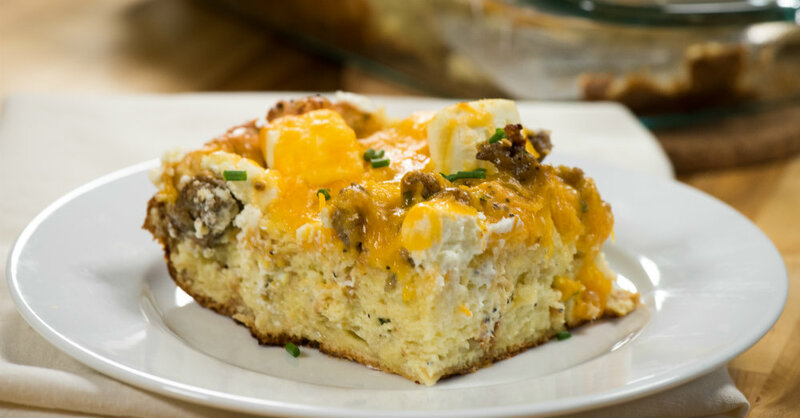 We incorporate some of the best breakfast staples – including bagels, cream cheese, eggs, and sausage – for this super simple breakfast casserole that is bursting with flavor. You can even prep this dish the night before, so all you have to do in the morning is pop it in the oven! Lightly grease a 9x13-inch baking dish with butter or non-stick spray. Cut bagels into small cubes and spread out along the bottom of baking dish, then layer cooked sausage on top. Pour egg mixture over the baking dish, then place cubed cream cheese pieces evenly across the bagels. Preheat oven to 450º F and bake casserole, covered, for 40 minutes, then uncover and bake for another 20 minutes, or until cheese is melted.